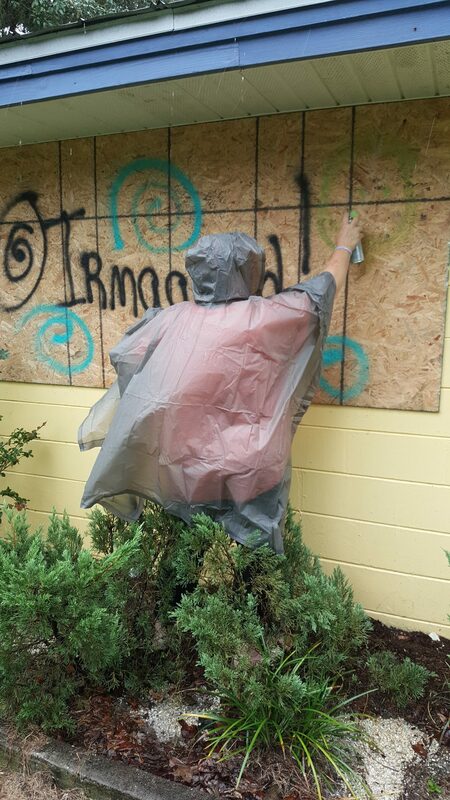 As the 2018 hurricane season begins, the PHA community reflects on the anniversary of last year’s terrible storms with an empowering tale of community, resourcefulness and courage. As we write this, it is exactly one year to the day that Hurricane Irma made landfall in Florida. We are watching the weather forecast now and seeing several areas of disturbance in the Atlantic that could pose a threat to us again. What did we do to prepare for last year and what are we doing now? Well, as a pulmonary hypertension (PH) support group we are all close and have contact with each other outside of our once-a-month meetings. Knowing that we had at least a week before the hurricane would hit, we reminded our support group members to ask their specialty pharmacists for overrides on their medications and be sure that they had enough supplies. We also told them to let their specialty pharmacy representatives know where they would be for further deliveries. Everybody got their oxygen tanks filled. We let our neighbors know where we would be, asked them to keep an eye on our house and gave them contact numbers. As group leaders, we ensured that we had contact information for all of our members and emailed or called to see what their plans were for the hurricane – who would be evacuating and who was staying – and asked them to update us after the storm had passed. Living in a state that is 361 miles wide and 447 miles long, with only two main highways out of the state – one on the east and one on the west – it was becoming very apparent that there was going to be major issues with traffic, lack of gas and hotel space. The burning question was where to go; this was turning out to be a massive hurricane that would affect the whole state. Fortunately, Jodi’s partner Liz runs a camp for people with disabilities in Brandon, just east of Tampa. It has a full commercial kitchen with propane stoves, a generator, an infirmary with hospital beds, six cabins, a maintenance director who is a survivalist, and the camp accepts pets, which was a major reason why many of our group could not go to special-needs shelters. Liz generously opened the camp facilities for the group and invited family members along, too. We rented an enclosed trailer and packed our equipment and that of several others, which included oxygen concentrators, BiPap, AVap and CPAP machines, nebulizers, liquid oxygen tanks, h tanks and even mobility scooters. None of the oxygen companies would move any equipment. This left us to bring our food and water, our hurricane supplies, our medicines and important papers – and of course, our pets. Others packed their own stuff and met us at camp. Everybody had a role and a task. We discussed what we would do in the event of a tornado, how much gas we had for the generator, and the importance of hooking ourselves up to a tank as soon as power went off. We also left the air conditioning running really cold so that when we did lose power, we would be cool for a while. One person only had a concentrator with home fill tanks, some had portable oxygen concentrators and so it was a case of sharing everybody’s supplies if we had to. When we finally got everything organized, we had five people with PH using concentrators and one senior citizen with COPD. There were three who used nebulizers and six who used some form of CPAP sleep machines. There were 15 of us, including two teenagers, five dogs, three birds, three rats and two cats hunkering down. The camp is close to three major hospitals and Brandon Ford (a car dealership) offered us use of their generator if we had any issues. We even had a TV hooked up with a primitive antenna, but it worked. We could keep ourselves informed about the hurricane with our phones, as well. Everything that needed charging was plugged in and ready. We were now ready to wait it out. When we lost power, we used the generator overnight to run all of the life sustaining equipment. During the days we hooked up to our oxygen tanks and used portable concentrators on battery power. We ate a lot, laughed a lot, prayed a lot, played games, talked and learned things about each other that we did not know. Oh yes! We drank some wine, too! Our experience brought us all much closer together. A year later, we would do it all over again in exactly the same way. The camp also now has a whole-house generator that will run the air conditioning, so we will be OK if we must evacuate again. Our PH family sticks together – we will go through this with each other’s support and assistance. If we must evacuate soon, we will be missing our member, Barb, who is recuperating from a double-lung transplant in a Boston hospital. We think that there will be more people with us this year if we must evacuate, as many others did not have such great experiences with evacuating. Things may be a little more crowded this year, but we will be there for each other. The most important thing we learned from this experience was to have a plan. We were not worried about the after. We concentrated on the now and would worry about medicines, oxygen etc. when we could assess the damage. The biggest lesson is that whatever this crazy disease does to our lives, we have each other, we have our PH family, and they will not let anything happen to us. We were safe, we were secure, and we were surrounded by love. Note: To assist with emergency preparation, the Pulmonary Hypertension Association (PHA) offers resources on the Pulmonary Hypertension Association website.